Part of the PR 100 collection, a hugely popular family within the Tissot range. This new piece has been launched to give a more modern look in keeping with contemporary style, yet seamlessly incorporating traditional watch design using quality materials and Swiss movement. Crafted in sleek stainless steel and featuring a distinctive deep blue dial. 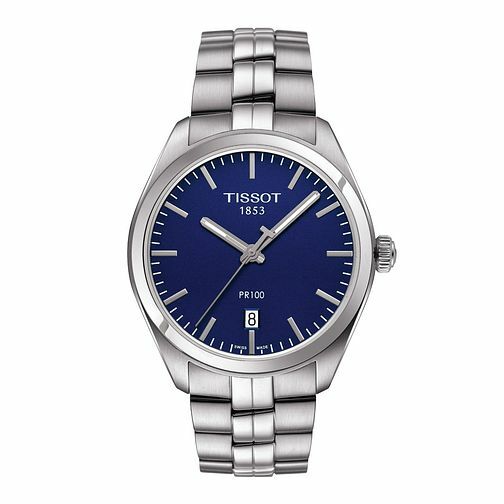 Tissot PR 100 men's stainless steel bracelet watch is rated 5.0 out of 5 by 1. Rated 5 out of 5 by Anonymous from Beautiful watch Simple but beautifully made watch. Excellent value for the quality of the watch. Would definitely recommend it. My husband was delighted with the gift.